The following Quick Start Guides have been prepared to aid new users in the operation of your new VOIP telephone system. It’s also a good idea for experienced users to review the documents for new feature sets which may not have been available during the initial installation. IPG Features Guide-Telephone covers basic telephone operations including placing and receiving calls, call forwarding to another extension or cell phone, call transferring, and more. 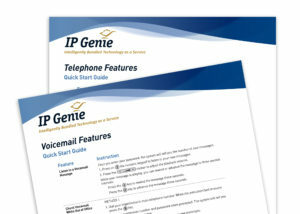 IPG Features Guide-Voicemail covers topics such as setting up a new voicemail box, changing passwords, busy and away greetings, and more. Each guide has been specially formatted to print on standard letter sized paper.